For (associated) chapel at NO 4407 9891, see NO49NW 19. The site of this castle on an island in Loch Kinord can still be traced in a dry season by the withered grass and vegetation (J G Michie 1910) Some large dressed stones line the edge of the island, which it is sugge ted may be partly or wholly artificial, similar to, and contemporary with, the crannog on the loch (See NO49NW 17) (J G Michie 1910; W D Simpson 1943; A Jervise 1875-9). As late as the mid-18th century parts of the timber causeway connecting the island to the N shore were in situ, and large numbers of oak piles have been removed (J Stuart 1868). The castle is first mentioned when used as a refuge for the Earl of Atholl after the battle of Culblean AD 1335 (W D Simpson 1929). In 1646 it was restored but in 1648 it was ordered to be slighted (W D Simpson 1929). (1) 5 canoes (see NO49NW 30-2), one of which remains in the loch about 30 yards SE of the crannog (NO49NW 17). Of the remainder pulled out of the loch, only one is preserved, and this is at Aboyne Castle. (2) A Medieval bronze jug (as shown on OS 6"map) probably the vessel aquired by the NMAS in 1900-1 (PSAS 1901). (3) A small bronze cup 2" high and 2 1/2" diameter presented to the National Museum of Antiquities of Scotland (NMAS) in 1912 (PSAS 1913). (4) A 13/16th century AD woodman's or carpenter's iron axe now in Inverurie Museum (PSAS 1950). (5) Oak piles, spearheads (including a bronze spear head - ? NO49NW 22) and various unclassified objects. J Stuart 1868; A Jervise 1875-9; Proc Soc Antiq Scot 1901; J G Michie 1910; W D Simpson 1929; Proc Soc Antiq Scot 1913; W D Simpson 1943; Proc Soc Antiq Scot 1950; C M Piggott 1955. A large natural island, c 3.0m high, on which no remains of the castle can be seen. The causeway too has disappeared. There is no canoe at Aboyne Castle, which is a ruin, and there is no knowledge of its present whereabouts. The Medieval axe was not seen at Inverurie Museum. There are no visible remains of this castle. It was possibly built in the 1400's as it is mentioned in 1505 and was the mansion of the Earl of Huntly in 1511. It was restored and garrisoned in 1646 but was razed by act of Parliament in 1648. 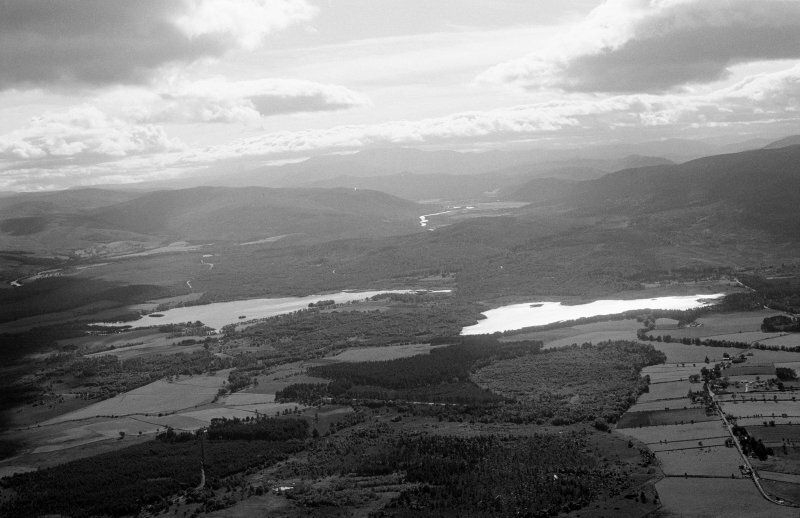 NO 44450 98930 This work was carried out, 16–31 October 2015, as part of a wider project investigating crannogs in NE Scotland and forms a large part of the author’s PhD research. Excavation aimed to establish the nature of Castle Island and to identify contexts that might provide well contextualised material for radiocarbon dating. A previous submerged survey of Castle Island had indicated an artificial origin below the waterline for the island. Excavation was preceded by three days (16–18 October 2015) of submerged survey which again revealed the artificial appearance of the submerged portions of Castle Island. Nine timbers and six vertical driven piles were identified in the water around the island in 1.5–2.5m of water. These features were surveyed using DGPS. A topographical survey was conducted over the whole of the island (both above and below the waterline) using a DGPS to take individual points with height data. This was then used to create a digital elevation model of the island. Two stone-built features were also identified and surveyed. The first is a possible boat naust, of which a maximum of two courses of stone work are visible on the surface. It is oval in shape and measures 3 x 5m. The other is also of dry stone construction, is more rectangular in shape, measures 3 x 7m, and can be presumed to be later as it appears to reuse stone and sits on top of consolidated material. Five trial trenches were opened on the island. 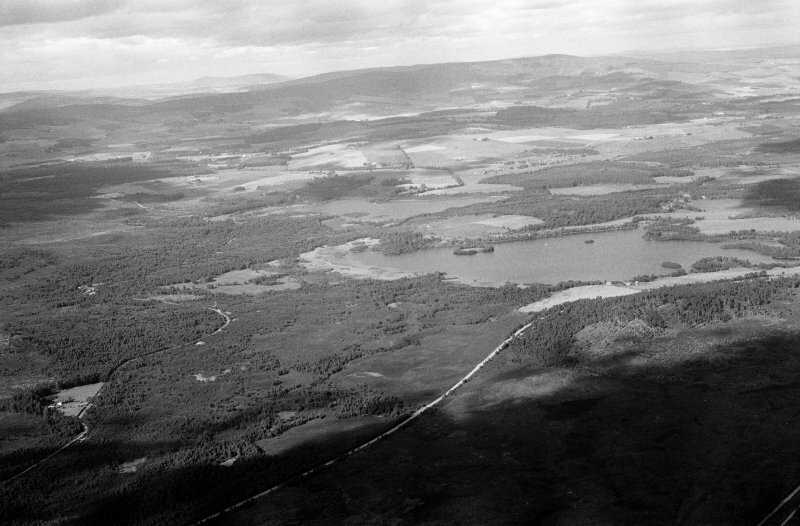 The first, a 1 x 1m trench, targeted the lower reaches of the mound, at the approximate location of the former shoreline of Loch Kinord (it was lowered in successive phases in the 19th century by a total of c1m). This trench recorded c1m of apparently eroded material, which had moved downslope. Below this was a compact layer of dark sediment with frequent charcoal inclusions, which overlay a sterile fine sand. The layer of dark sediment is probably a midden layer at the edge of the former island. Crucially, it reveals the height of the probably scarped sides of the island. Two other 1 x 1m trenches were placed in the central flat area of the island. These trenches revealed that the topsoil consistently contains charcoal. Both trenches came down onto natural sands, gravel and cobbles after c0.2m of topsoil and subsoil. These trenches clearly established the natural origin of the island. A fourth trench, measuring 3 x 2m with a 1 x 1m annexe, was opened over the break of slope from the central flat area to the side of the island. This trench revealed substantial deposits and negative cut features including a 1.45m deep pit. These contexts were half-sectioned and bulk samples were taken for flotation. A 10 x 30mm fragment of a crucible was recovered from this trench. It is thin walled and its fabric is porous with the surfaces appearing to have been subject to vitrification. A final 0.5 x 0.5m trench was opened in a third location on the central flat area of the island. This trench revealed an anomalous slope to the underlying natural which appeared to slope inwards towards the centre of the island. The excavation results demonstrated that Castle Island is not a crannog in the classic sense, as initially thought. Rather it appears that large amounts of natural deposits have been reworked and moved downslope giving the appearance of an artificial island below the waterline. The site is probably best classified as an insular island motte.